(P1) U Myint Kyaw Thu says he wanted to make games since he was a five-year-old playing Nintendo. (P2) But growing up in Burma, now Myanmar, there was no Internet and PRECIOUS FEW mobile phones. (P3) So when he founded Total Gameplay Studio with his brother in 2005, he had to develop games for international buyers – the domestic market just wasn’t developed enough. (P4) But now, millions have EMBRACED mobile technology in Myanmar. (P5) Now he can do what he always wanted to do FROM THE START – develop games for mobile about his own culture. (P6) Total Gameplay says it now has about 200,000 players on its platform. (P7) Three years ago, less than 10% of Myanmar’s population owned a phone, putting it slightly above Eritrea and North Korea. Now the figure is closer to 40%. (P8) Connectivity is SPREADING LIKE WILDFIRE, opening up new opportunities for start-ups and ESTABLISHED businesses alike. (P10) This technological growth is GOING HAND-IN-HAND with the opening up of the country’s political system – in just over a week its people HEAD TO THE POLLS in an historic election. (P11) Smartphones have dropped sharply in price, meaning that first-time cellular phone buyers will often go directly to smart devices and LEAPFROG onto the mobile internet. 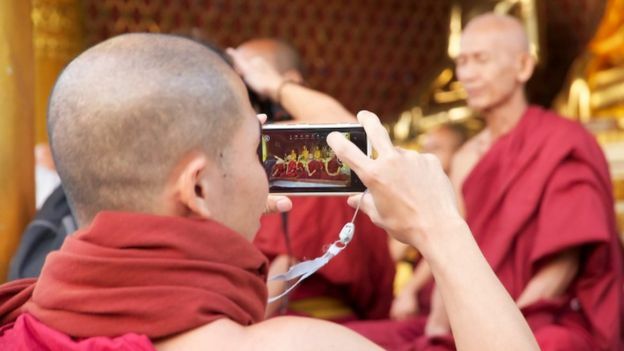 (P12) With around 30 million SIM cards now on the market – the population is about 54 million – Myanmar’s new mobile users represent a VAST audience hungry for data – one with UNMET needs that entrepreneurs are eager to serve. (P13) It is amazing to think that not long ago, Myanmar had no Internet at all. When did mobile technology first start to become popular in your country? Have you ever thought about working for or investing in a tech start-up?